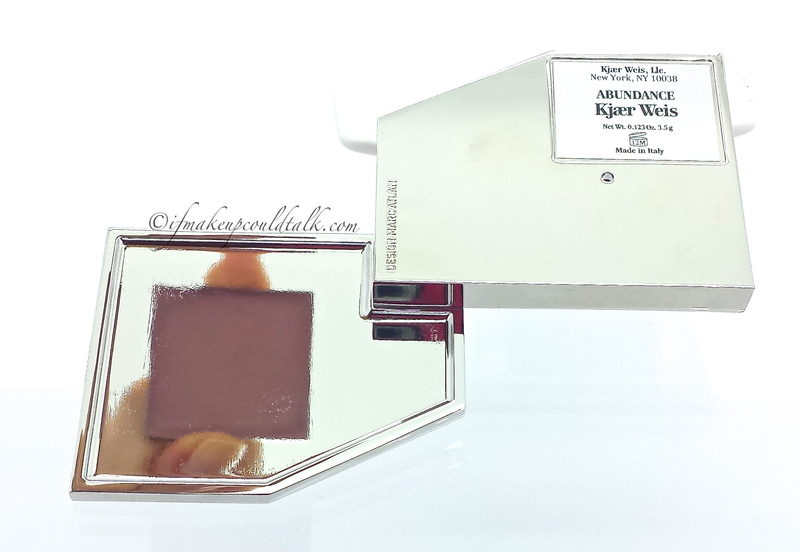 Home Brands and Products Kjaer Weis Radiance Highighter. 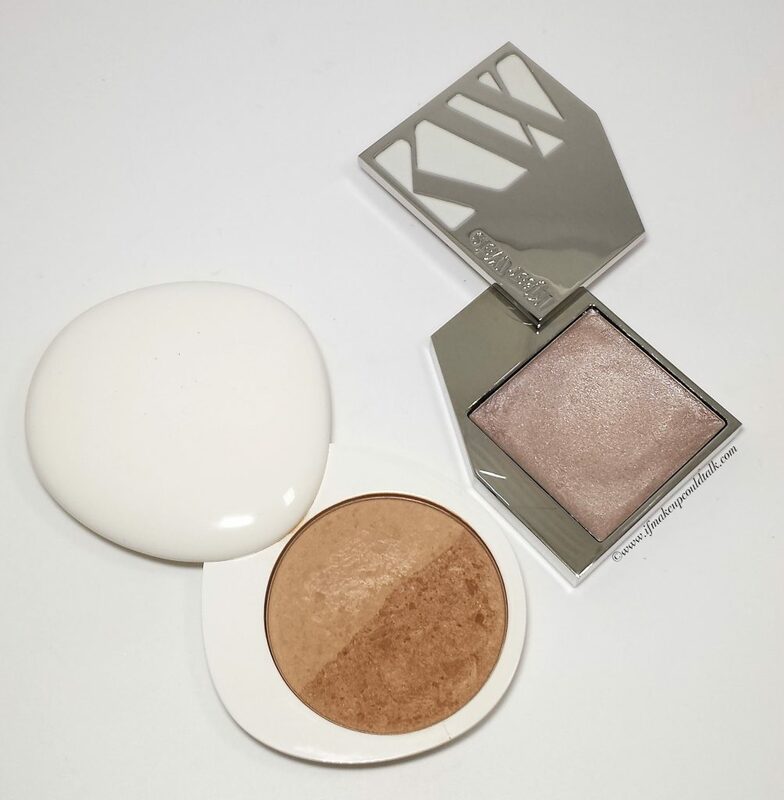 Here Comes the Sun with Kjaer Weis Radiance Highlighter. 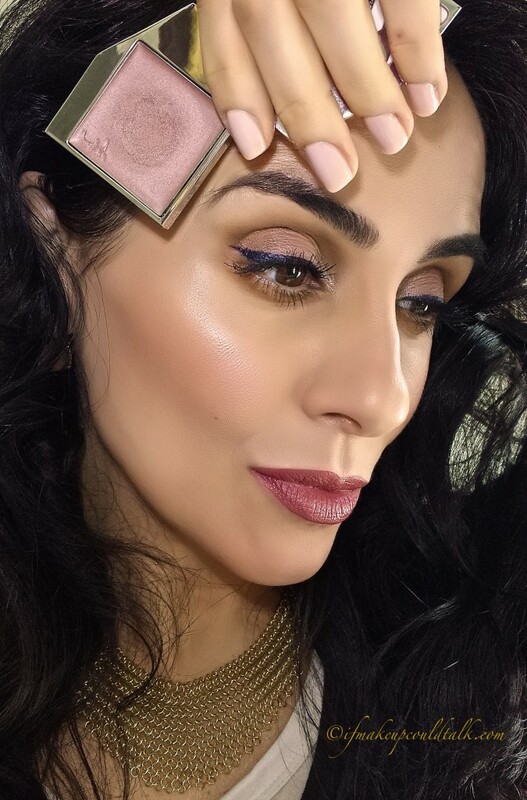 Radiance Highlighter and Divine Eyeshadow. 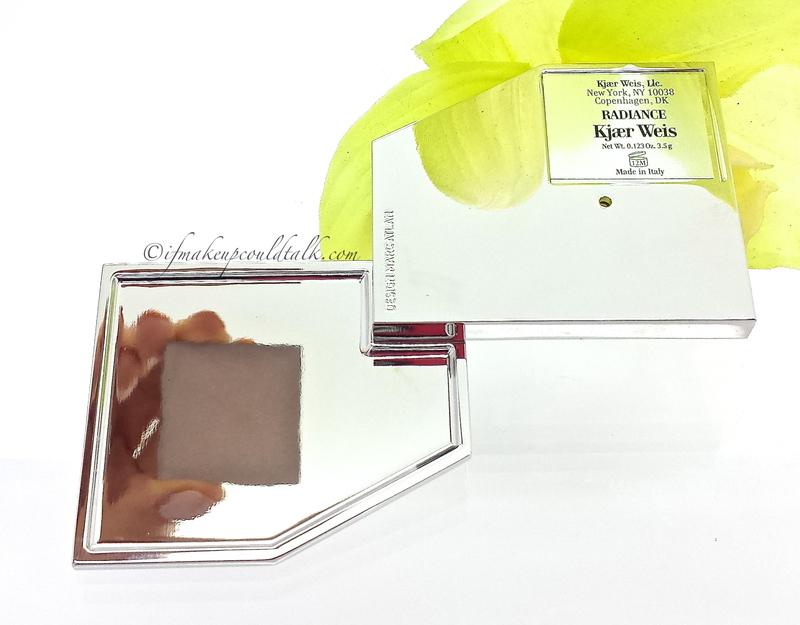 Kjaer Weis Radiance Highlighter swivels open to reveal a mirror-like surface. 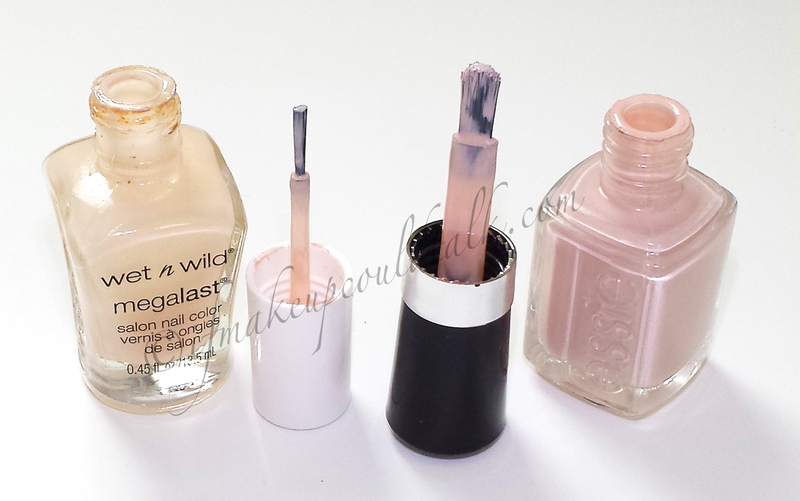 As with all Kjaer Weis products, the presentation is truly outstanding. 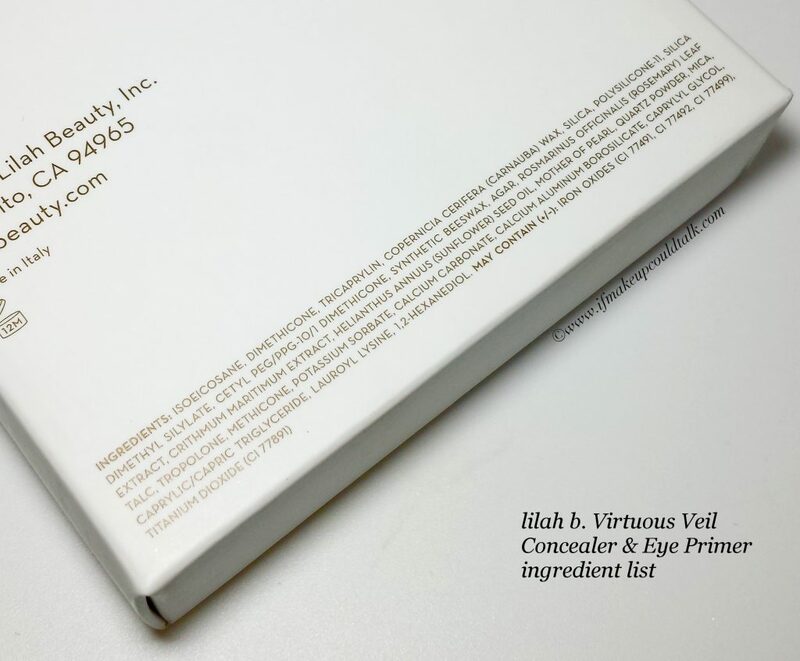 The hefty metal compact is enclosed in a thick cardboard box, made to resemble faux leather. 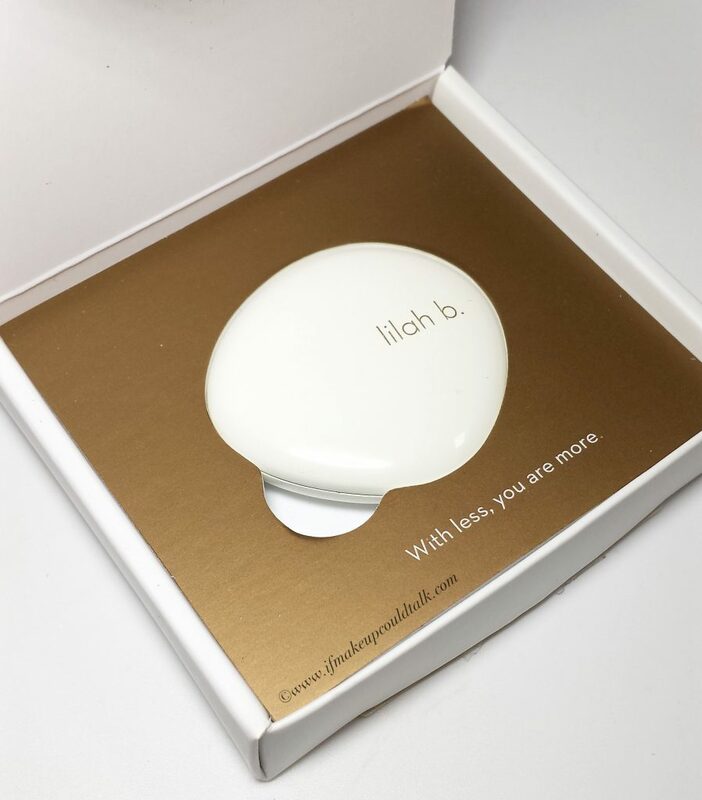 Sleek magnetic compact swivels open full circle. 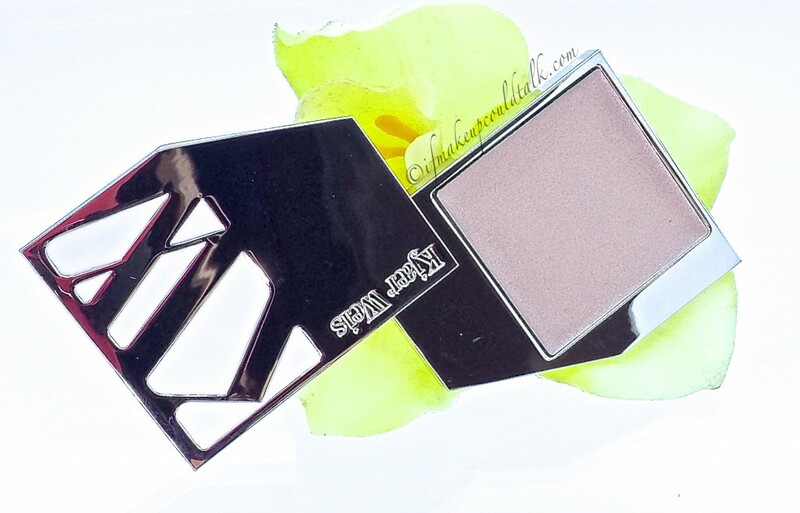 High polish chrome finish can be used as a mirror for touch-ups during the day. 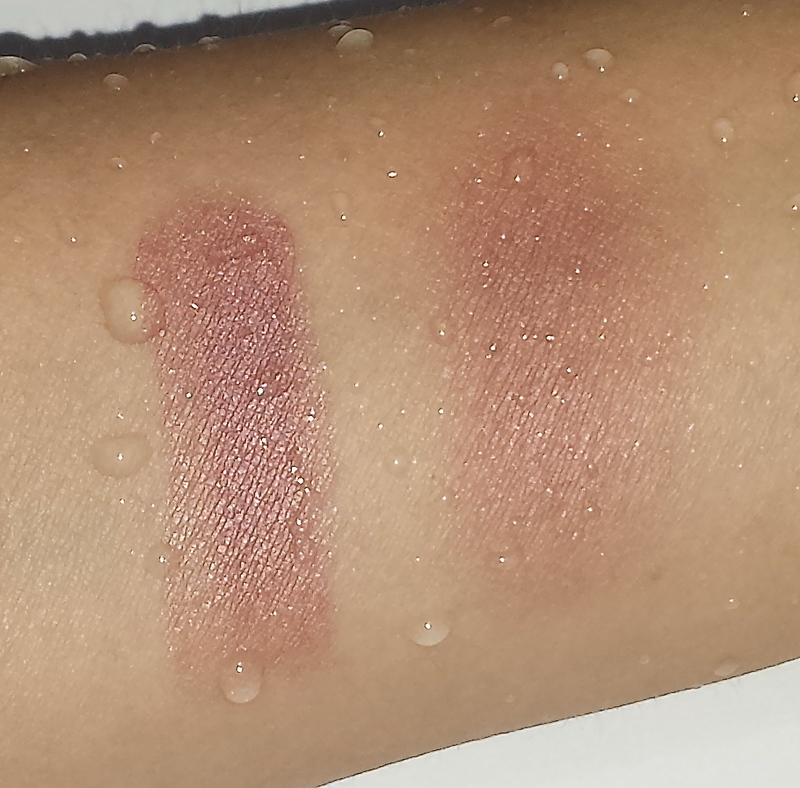 Compact can also house KW blush refills. 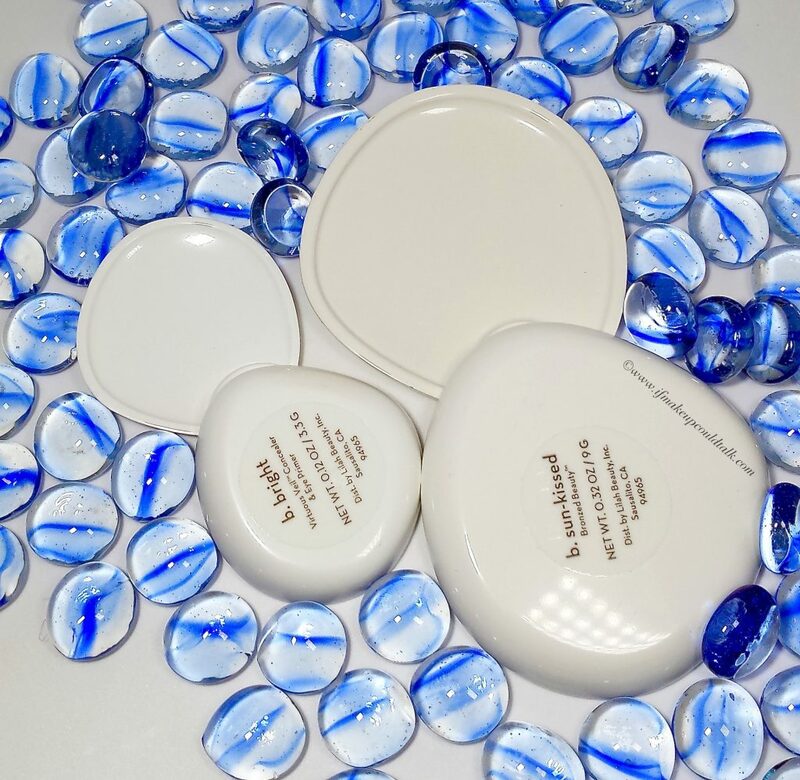 All KW products can be purchased in refillable pan form to save on the expense of the compact ($23). 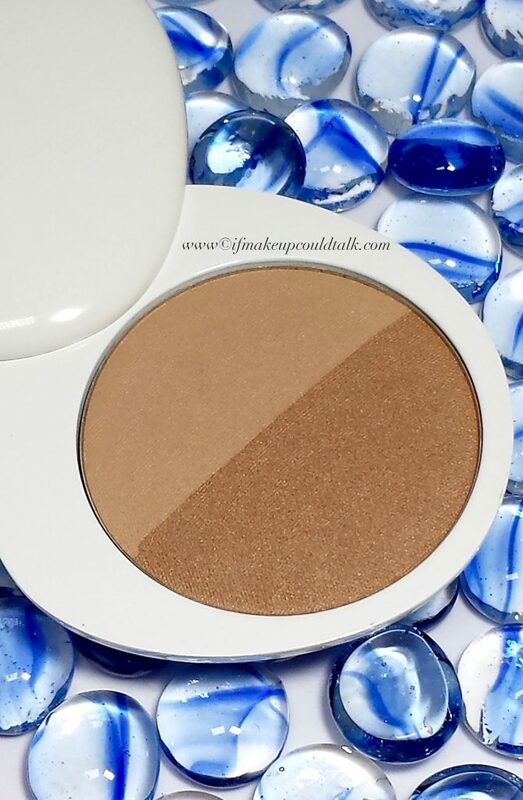 When compared to its eyeshadow comrade, Radiance Highlighter Compact is more substantial and makes an impressive statement. I’m beyond thrilled with the purchase of this compact. 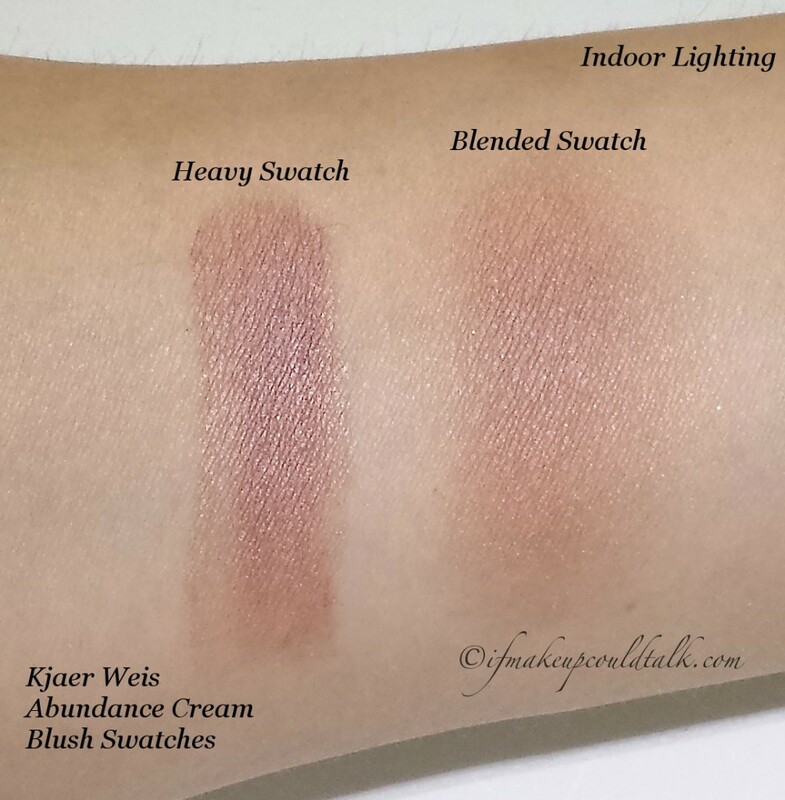 Kjaer Weis Radiance Highlighter swatch. 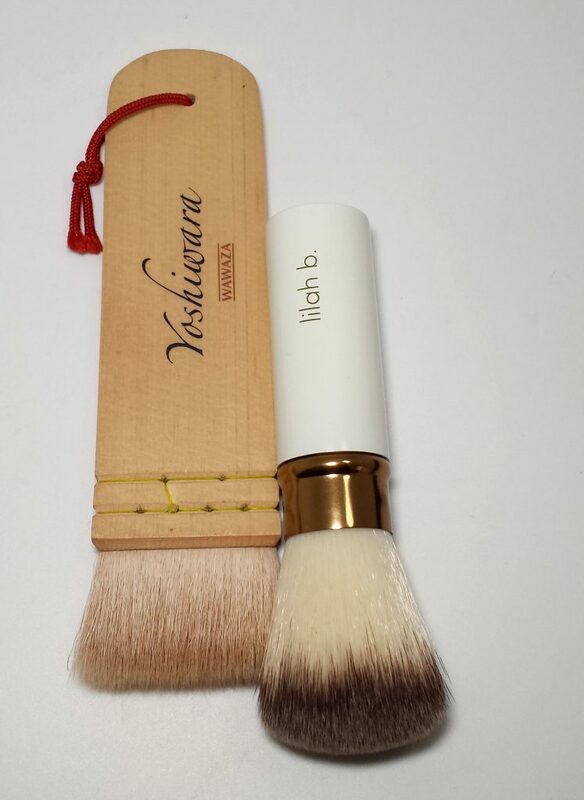 The feather light texture and drier consistency makes this suitable for all skin types. 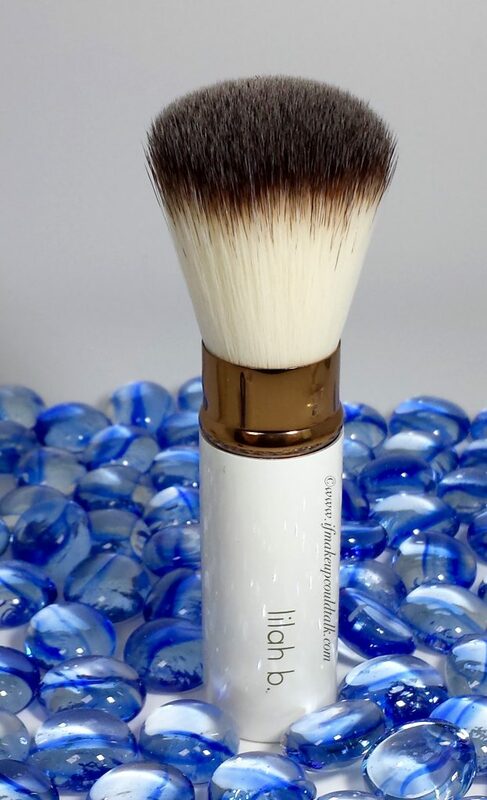 If RMS Living Luminizer was too emollient for your tastes, this could very well be the perfect natural remedy. Made in Italy with 95% of the ingredients organically grown. 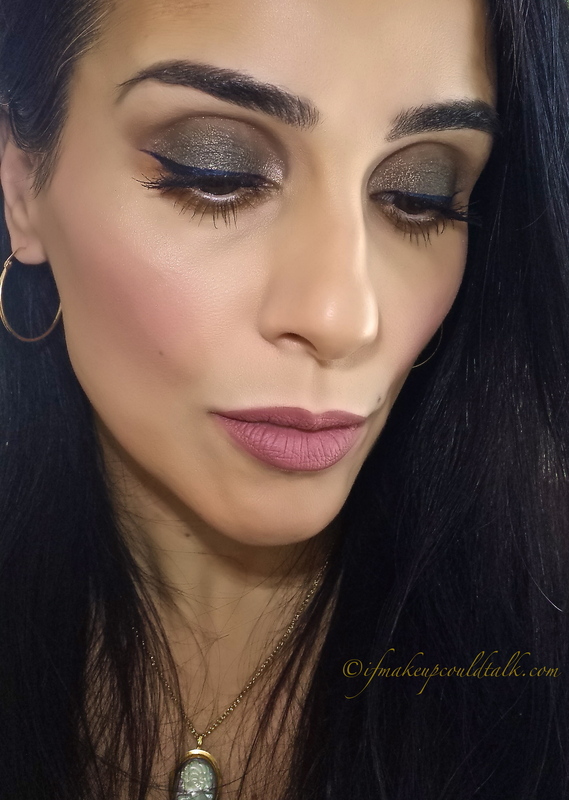 The slight lavender undertones exudes a subtle warmth that combines beautifully with the silver pearl (mica); a pairing that is rather flattering against my olive complexion. 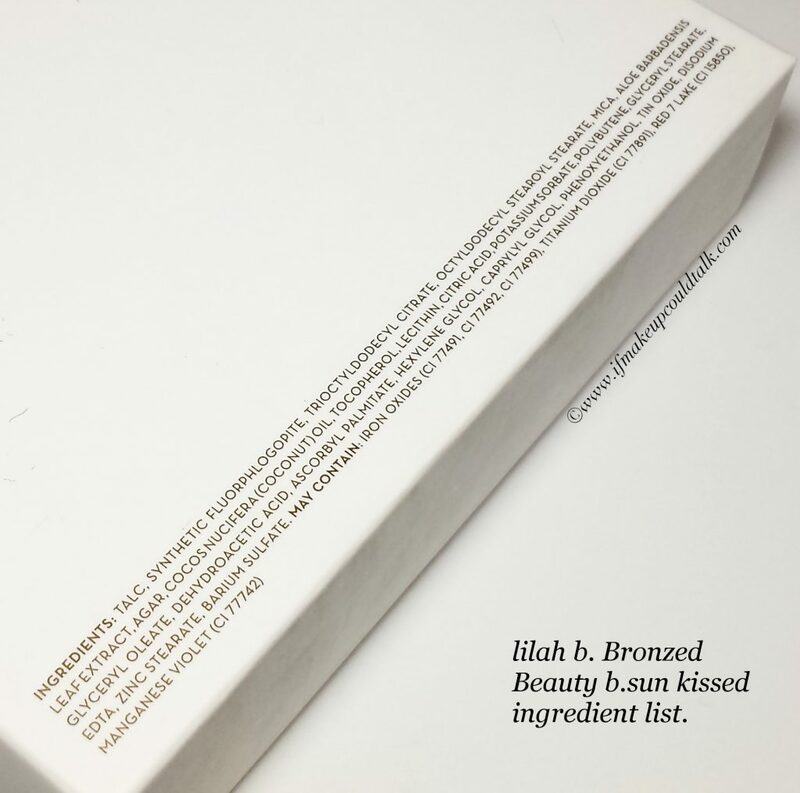 Due to the soft cream base and abundance of mica particles, minimal product is needed to achieve desired results. 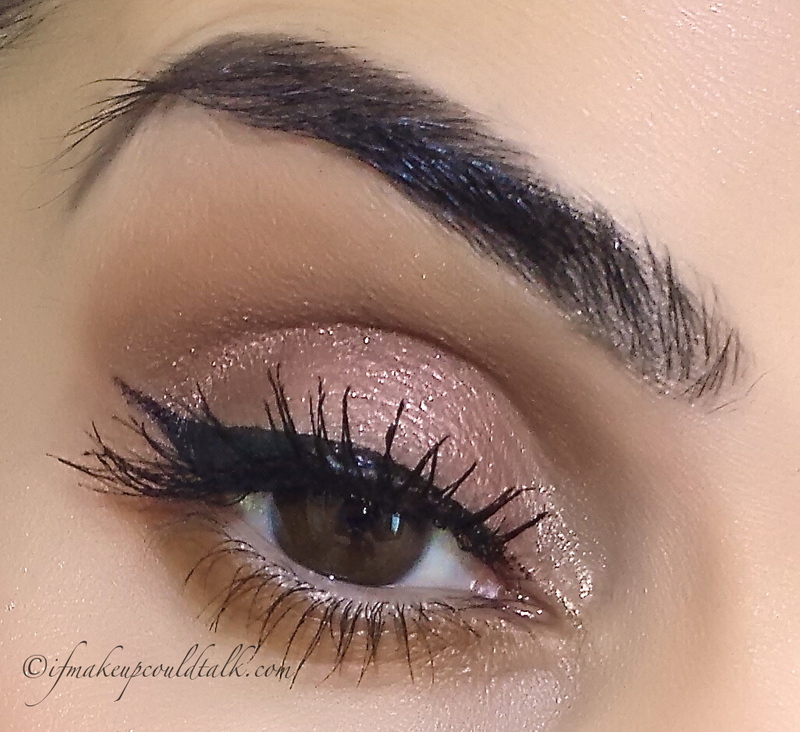 For some reason, Radiance looks particularly striking when paired with cream blush formulas. Lasts amazingly well on my dry skin, with minor fading by the end of a 12 hour day (this may vary on oiler skins). 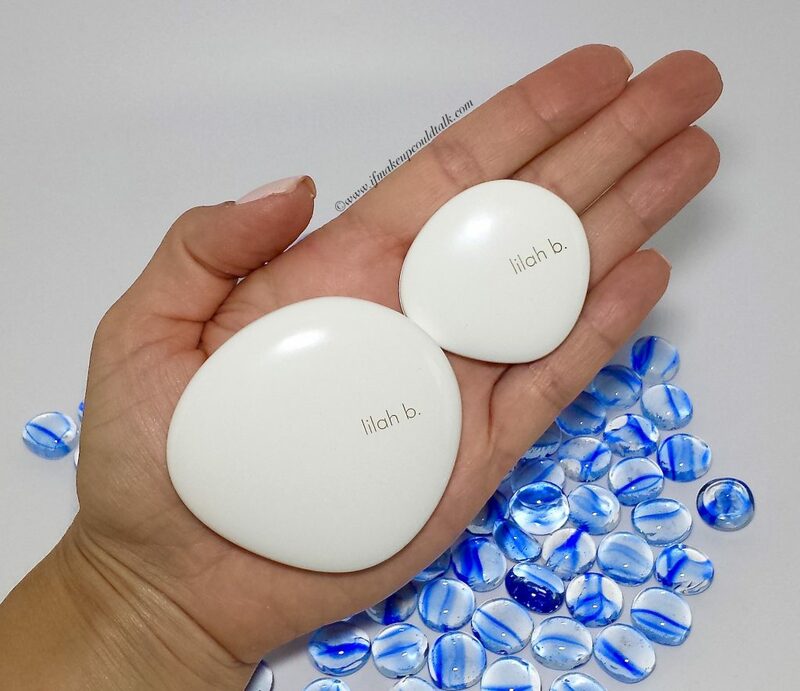 Despite its impressive longevity, Radiance does not fully set, therefore, resist the urge to touch your face. 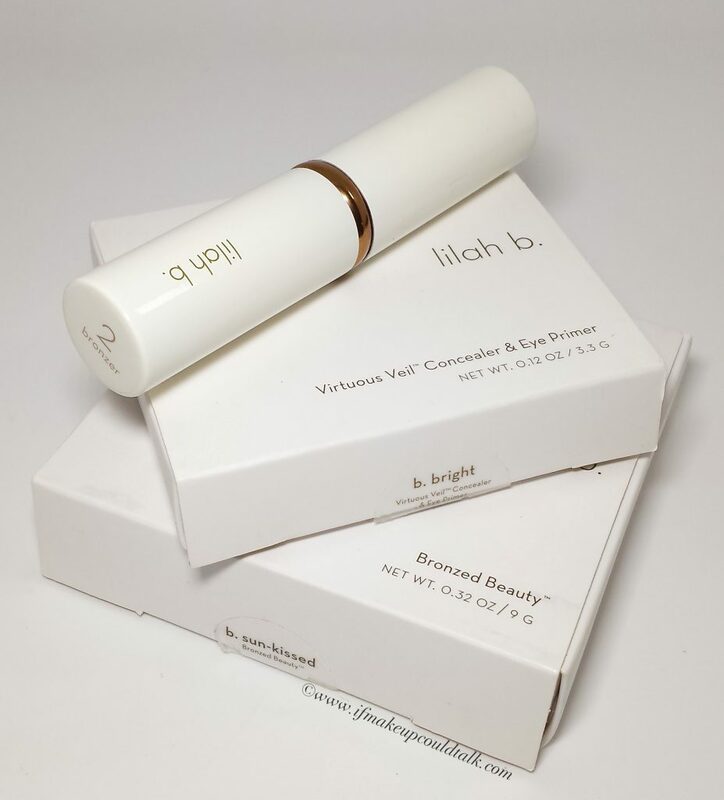 Lasts 10 hours (over a primer) when applied as an eyeshadow, without creasing or color transfer to the orbital bone area. 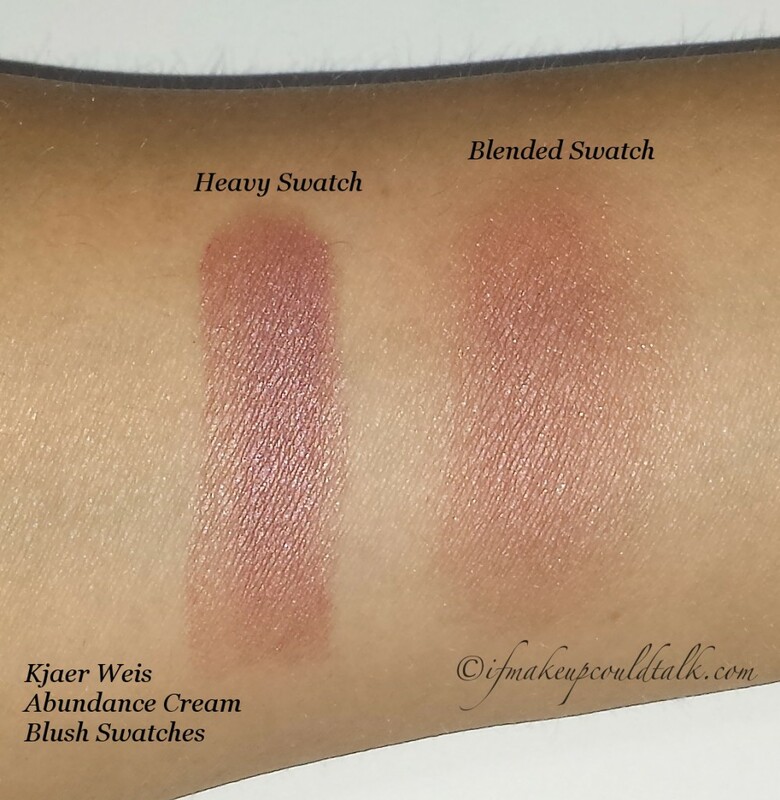 If applied heavily, the substantial pearl in the formula builds up quickly and can appear too stark against medium/darker skins–less is best. 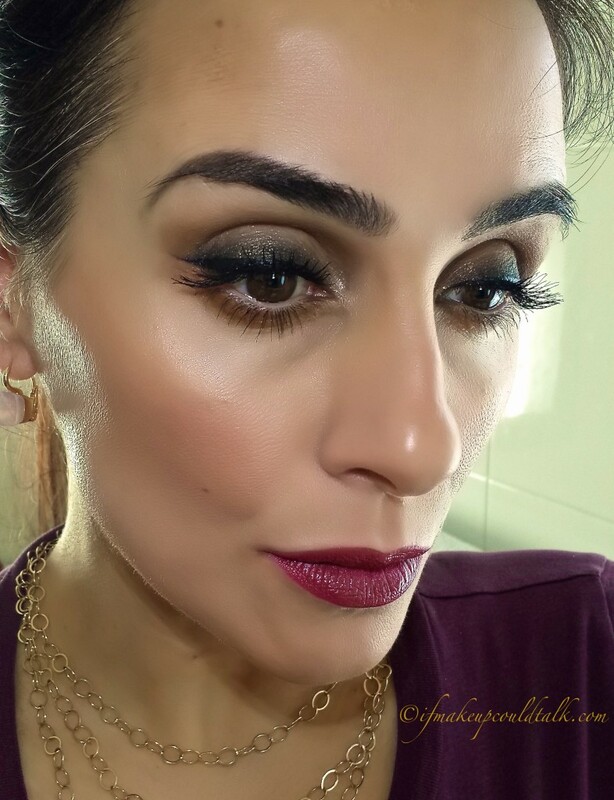 Kjaer Weis Radiance Highlighter worn on the tops of the cheek bones with YSL 11 Baby Doll Kiss and Blush cream blush. 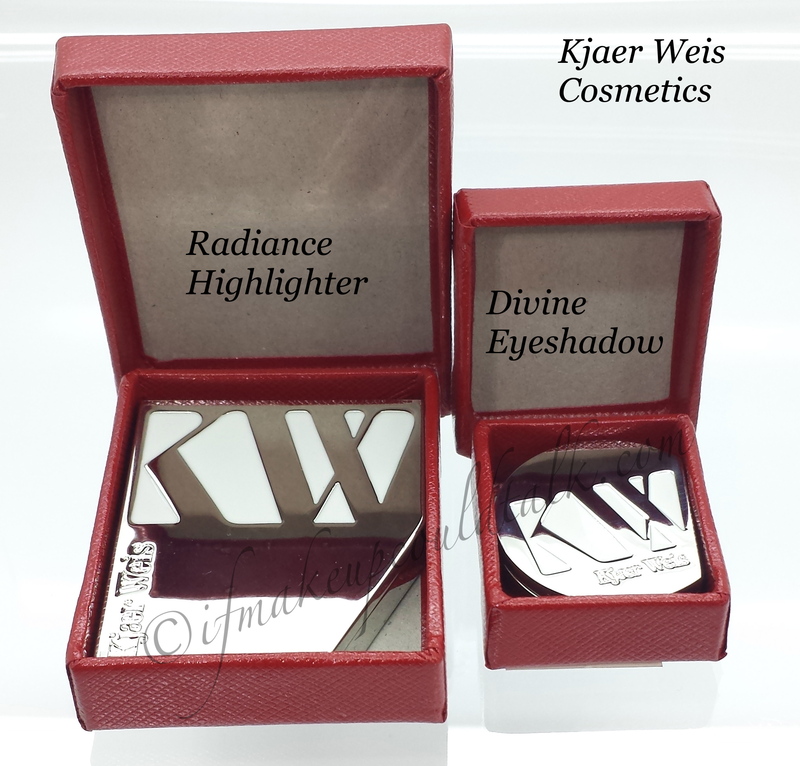 Kjaer Weis Radiance Highlighter worn on the mobile lid and inner corner with Divine Eyeshadow. 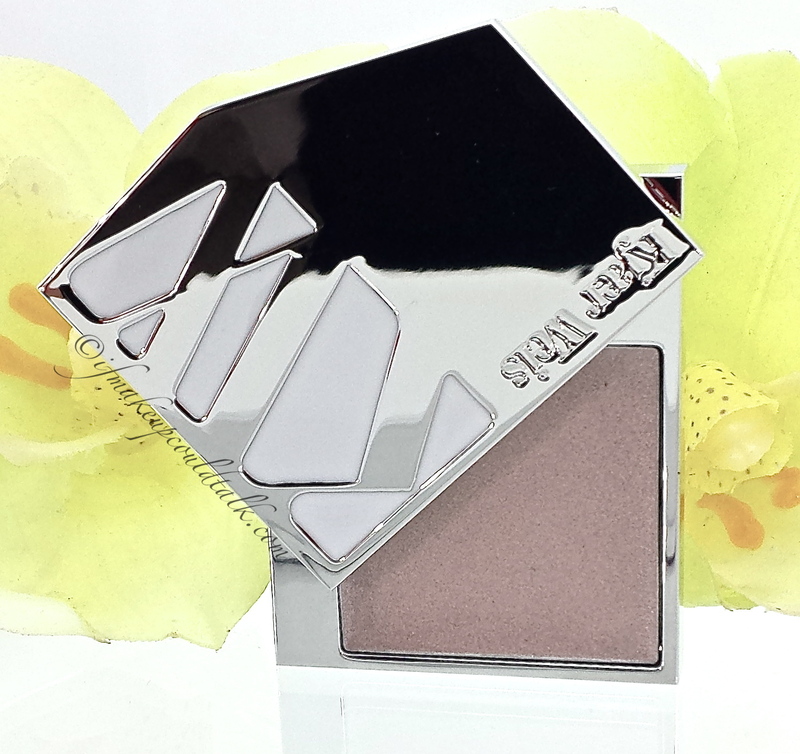 Kjaer Weis Radiance Highligter used as a stand alone eyeshadow with Magnetic Eyeshadow. 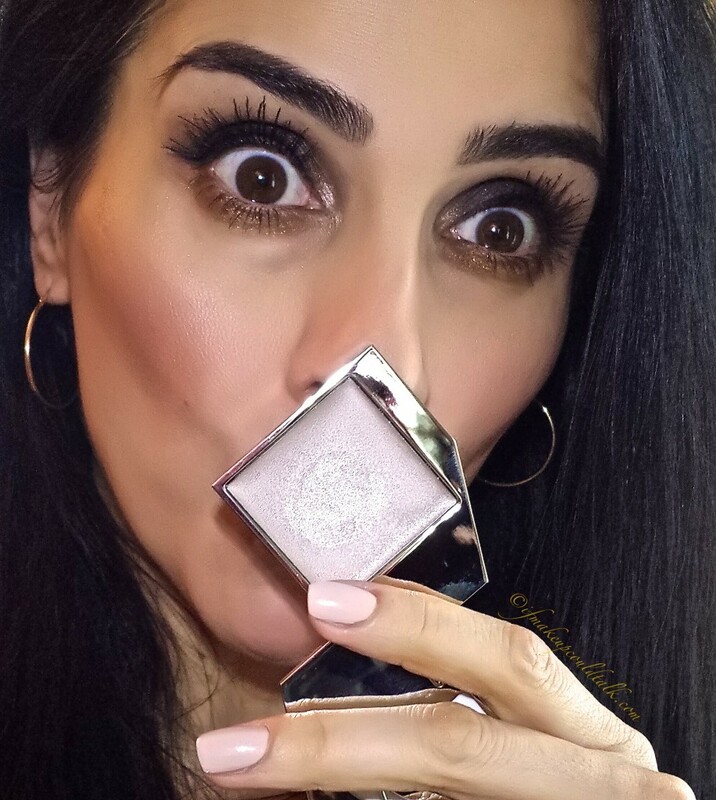 My preferred method of application is achieved by swirling my ring finger in the pan and lightly tapping Radiance on the skin. 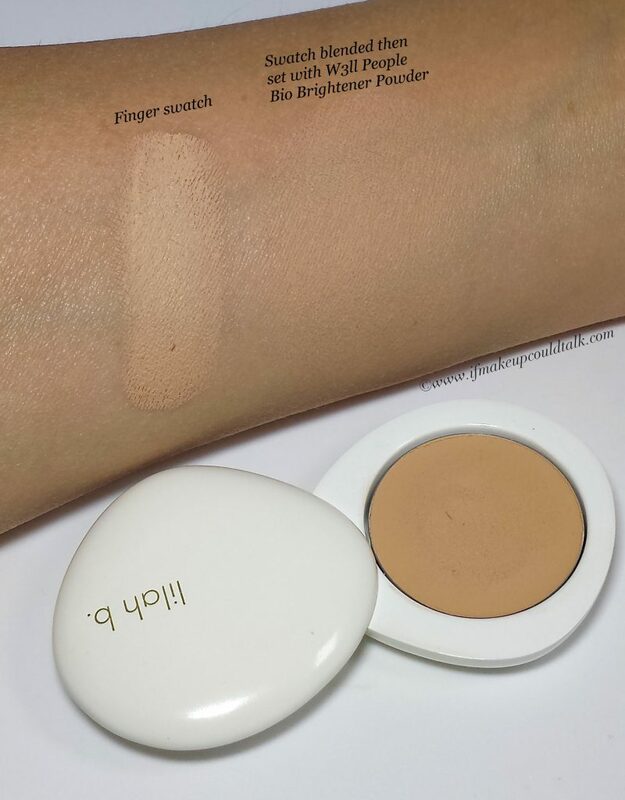 Radiance blends easily on bare skin and over powder foundation. 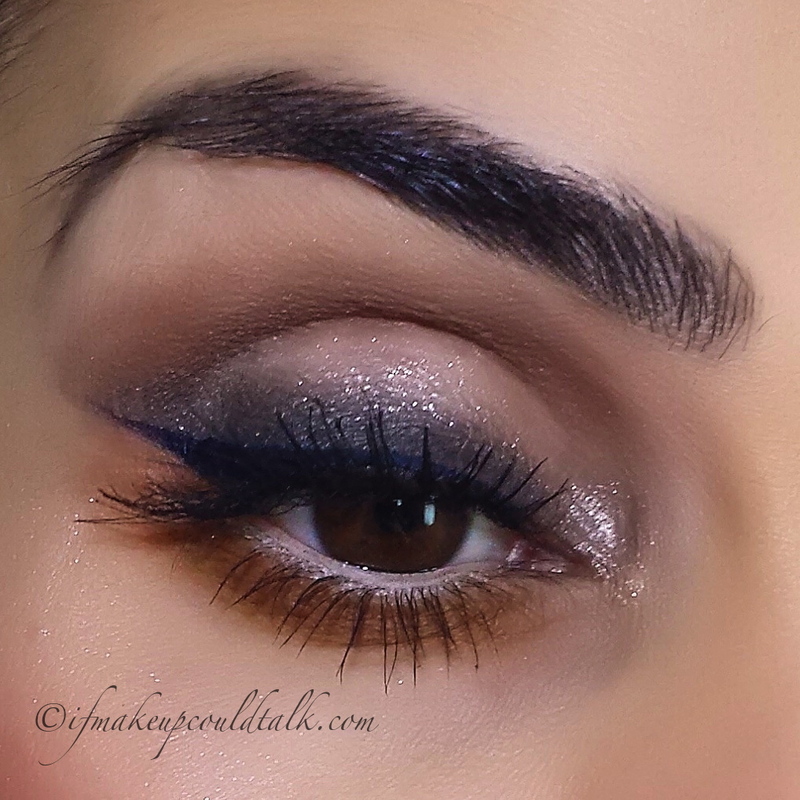 When applied as an eyeshadow, fingers work best using light tapping motions. 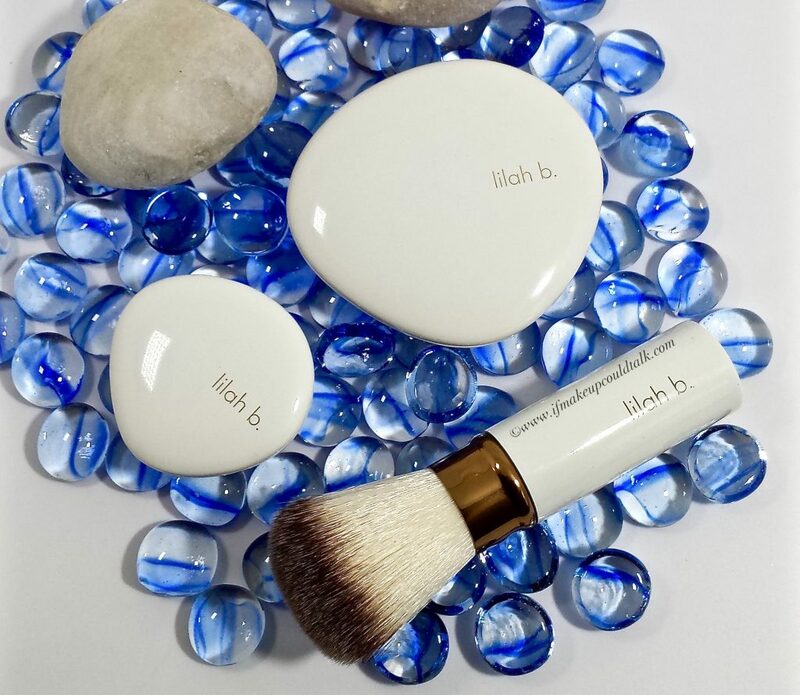 A small synthetic brush (Billy B #12) was used to place Radiance on the inner corner of the eyes. 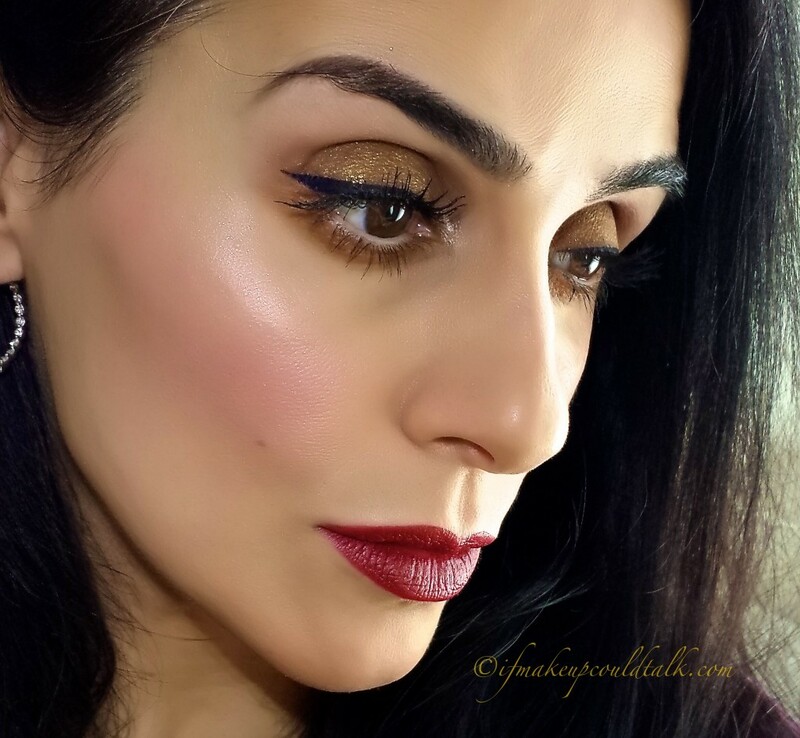 Radiance does not settle into pores or fine lines. 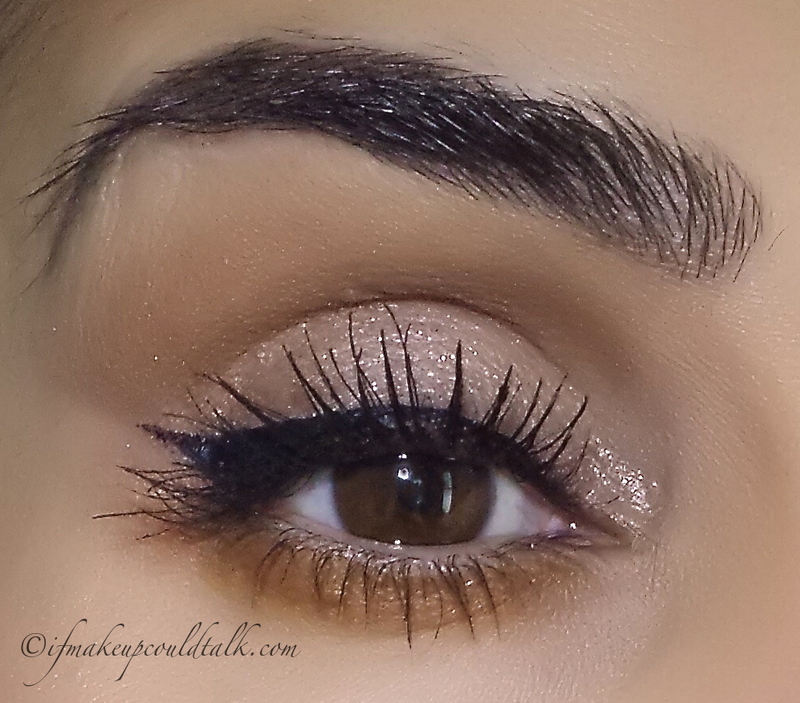 However, as with all highlighting products, a light touch is highly recommended to avoid looking overdone. 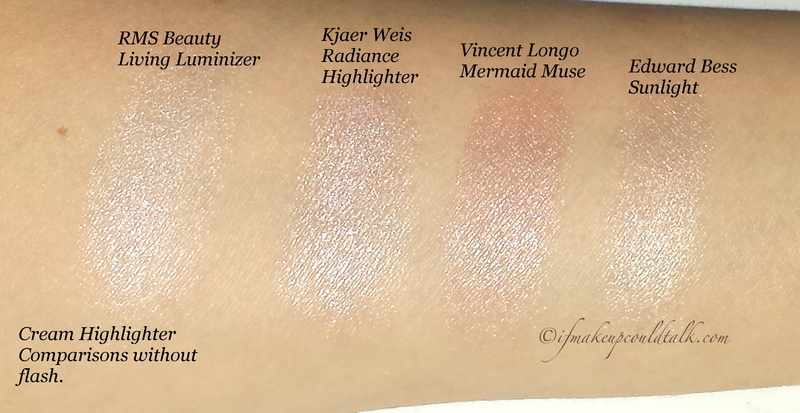 Cream Highlighter Comparisons without flash. 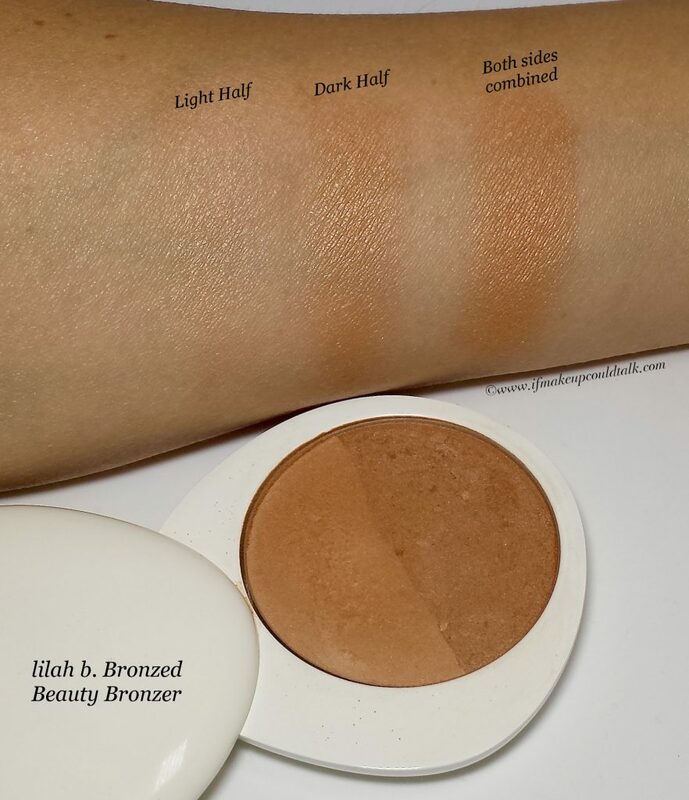 Cream Highlighter Comparisons with flash. 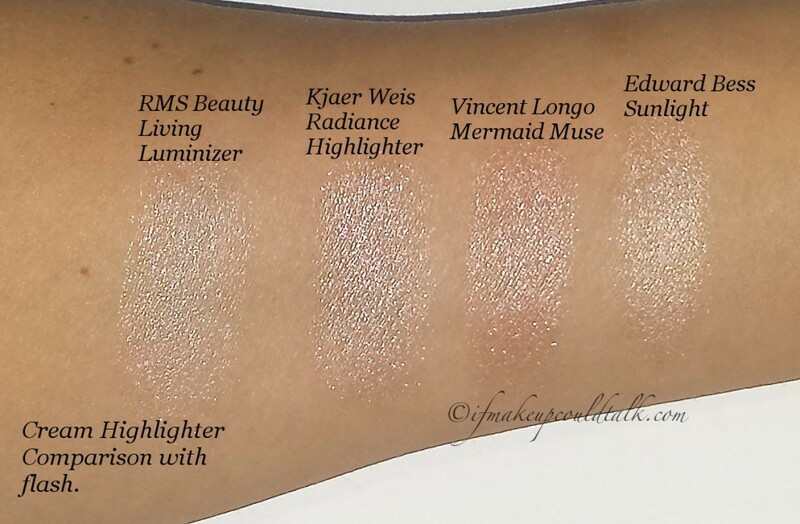 RMS Beauty Living Luminizer is sheer and paler in color than KW Radiance. 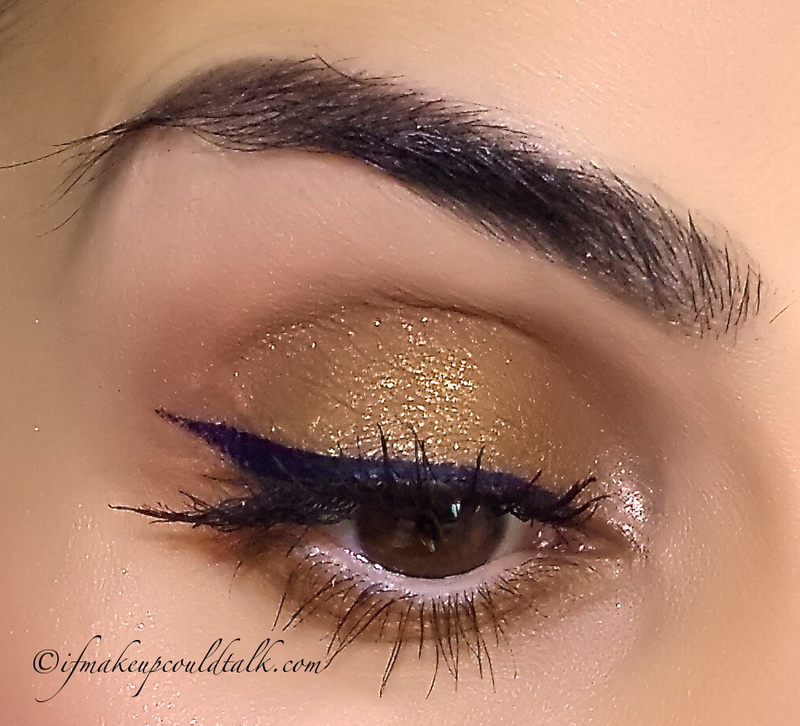 The organic coconut oil based formula solidifies during the cooler months. On my dry skin, this is lovely, however, the emollient nature has been known to look too greasy on oiler skins. In addition, some people are allergic to Coconut Oil. 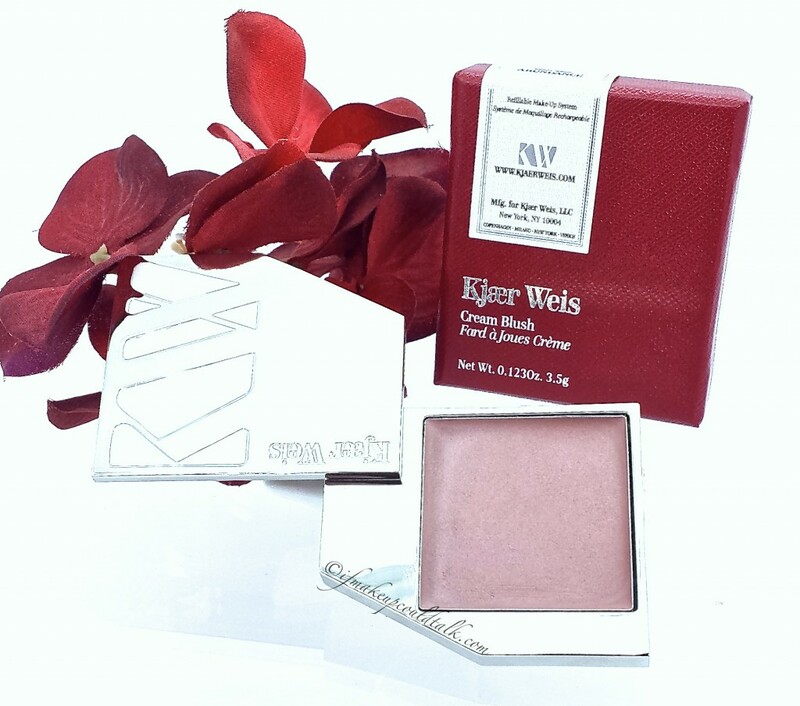 Kjaer Weis Radiance Highlighter has a balance of cool and warm properties. 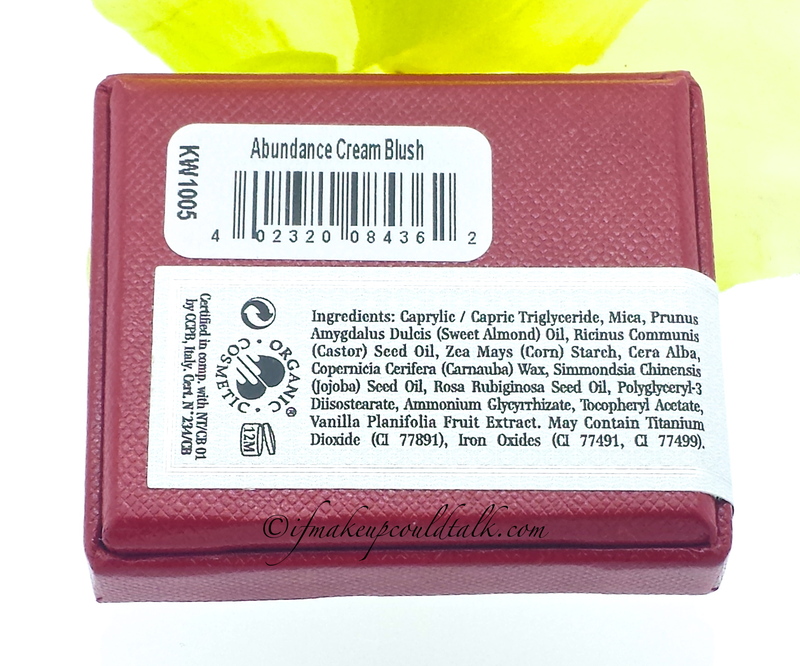 This organic formula stays true to its creamy composition in any season and the longevity is remarkable. 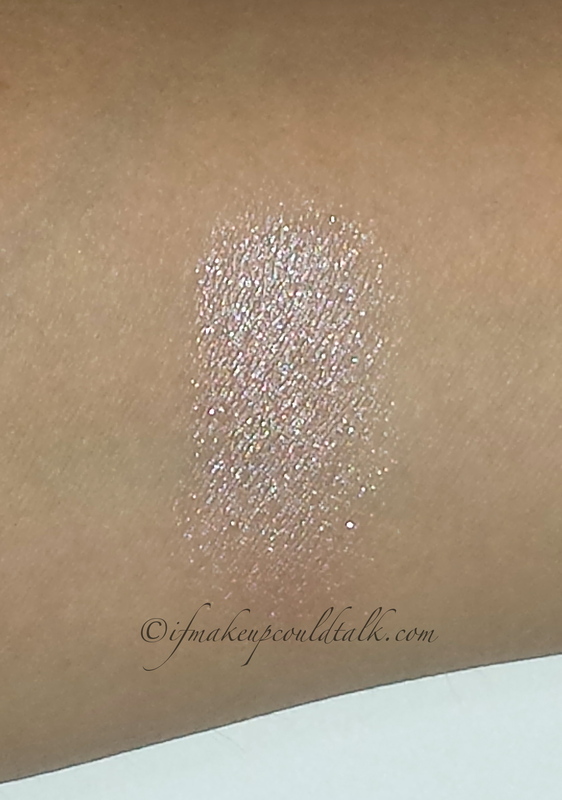 Vincent Longo Mermaid Muse is a fabulous highlighter and obviously warmer than all the others. 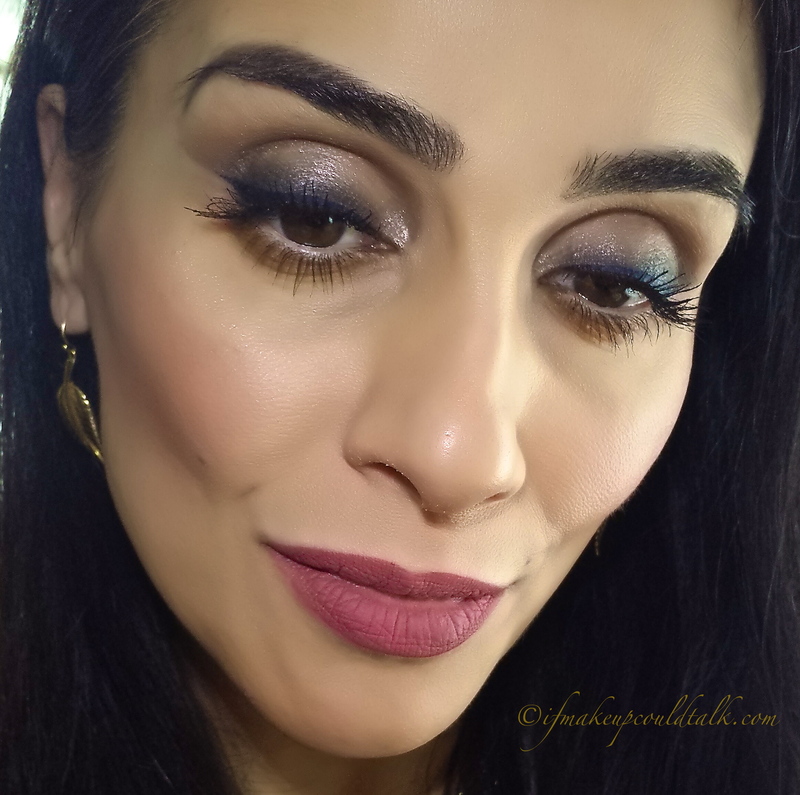 This chemically based formula does not budge once it has set. 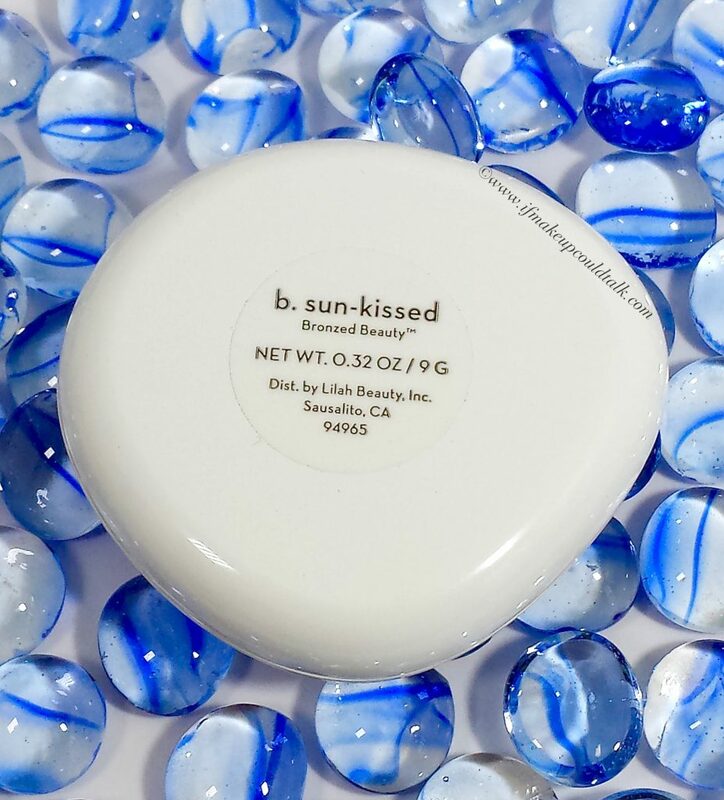 Edward Bess Sunlight is more golden than KW Radiance. This is a wonderful highlighter as well, but the packaging and price/amount ratio pales in comparison to KW. 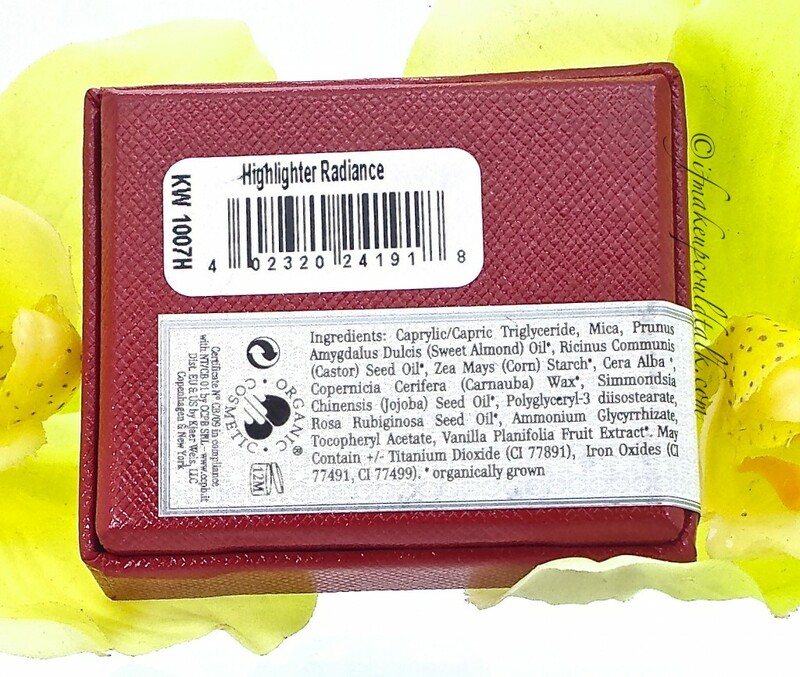 Kjaer Weis Radiance Highlighter ingredient list. 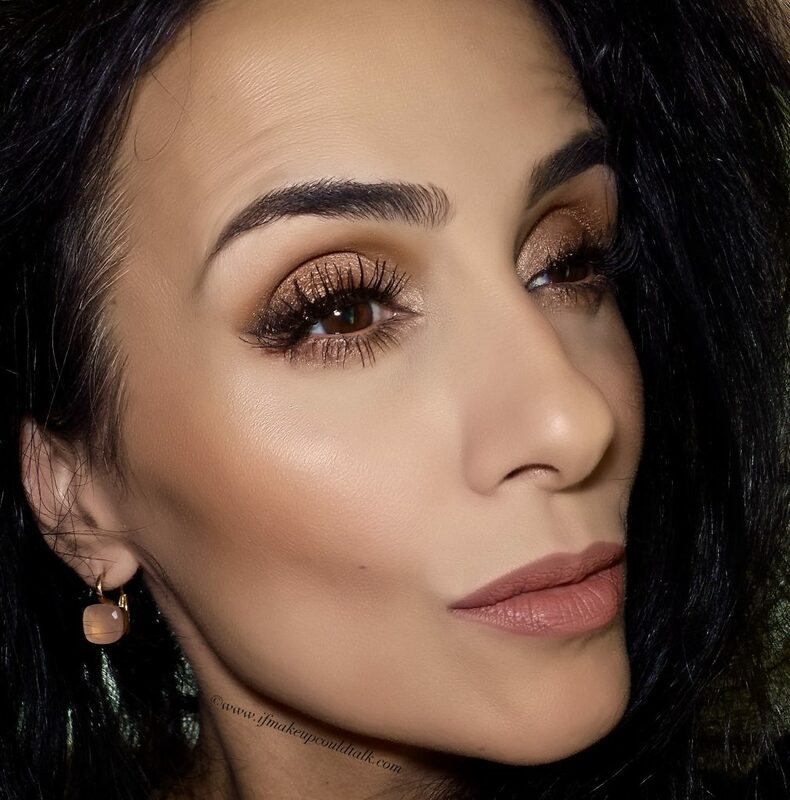 Full Face wearing Kjaer Weis Radiance Highlighter on the cheeks and as an eyeshadow, along with KW Divine and Magnetic Eyeshadows. 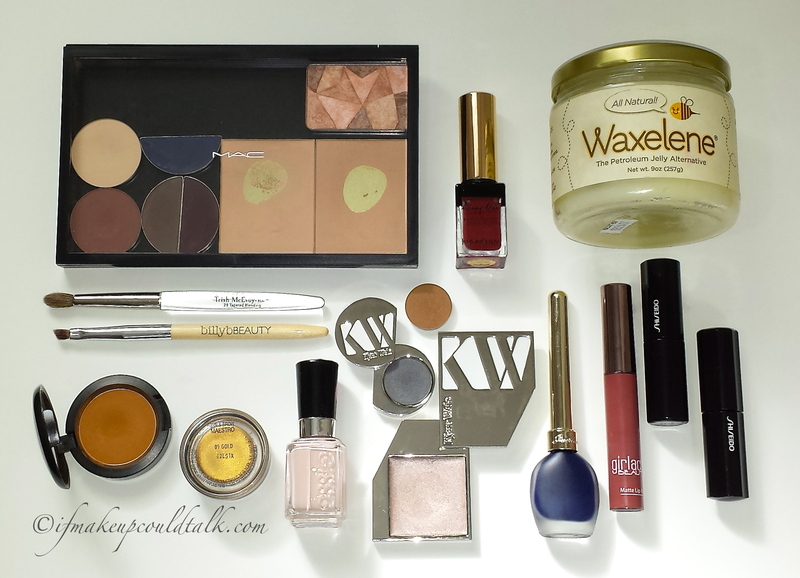 Makeup would state the obvious–Kjaer Weis Radiance Highlighter is one of the best products I have come across. 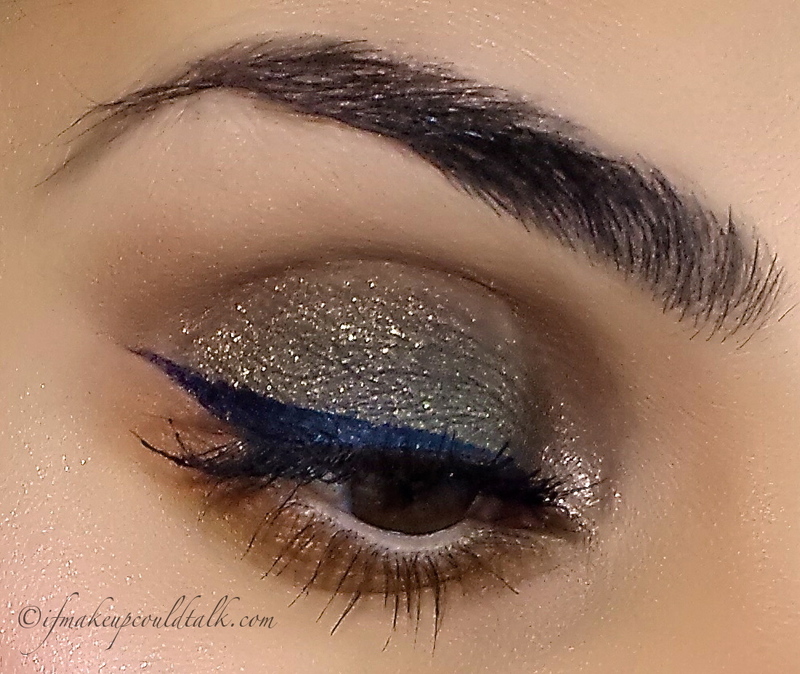 The versatility of this organic gem is unsurpassed. Do I recommend this investment? Wholeheartedly, indubitably, undoubtably, irrefutably…YES!! Until next time, be well, stay safe and be happy.